Hey, guys! Long time no see. I feel like it’s been ages since we last talked. …Whoops, I guess it really has been a while, huh? I realize it’s been several months since my last post here (almost a year since my last recipe!? ), but hopefully you all don’t mind me popping back in. Have you ever fallen into a breakfast rut? For the past several months, I had a part-time job that required a lot of flexibility on my end. Sometimes I’d have work in the morning, many times in the afternoon, and oftentimes during the evening. Honestly, over the course of my time there, I’m pretty sure I worked every single hour of the day at some point (although not all at once, thank goodness). But, during those early mornings when I had to work, I liked to sleep in for as long as possible. This led to me allotting around ten minutes to eat breakfast, ten to get ready, and five to ten for the in-general prepping of myself for the day before heading out. There really wasn’t much in the way of creative cooking during those months; I’ll admit my diet lacked a lot in the way of variety. The first meal of my day generally consisted of cereal, toast, or a yogurt parfait (although several weeks ago there was a period with fruit salad thrown in that was probably the breakfast highlight of my month). Essentially, I ate nothing that required me being very imaginative that early in the morning and nothing that required much prep time. “Okay, Demelza. That’s great and all, but where do the biscuits come in?” I’m glad you asked. Biscuits are kind of a guilty pleasure of mine. I don’t eat them a lot because it’s a little hard to justify what basically amounts to the empty calorie consumption of butter and white flour. And so, come Thanksgiving or the rare holiday occasion my mom pops a canister of Pillsbury open, I find it difficult not to dip my hand into the bread basket, so to speak. Warm, fluffy and tender mounds of goodness…what is not to love? Unfortunately, most homemade biscuit recipes call for tons of butter, cream, or vegetable shortening. They’re not very nutritious, and as for those canned biscuits…well, they have a longer list of ingredients than I typically like. So, what’s a girl to do when she has a biscuit craving and some newly freed up time on her hands? Well, she experiments with healthier alternatives, of course! 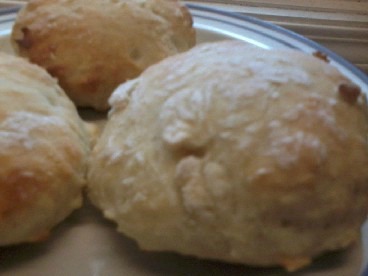 And so I bring you…Greek yogurt biscuits. Mine are a slightly simplified version of a recipe I discovered on healthyrecipesblogs. These babies are tender and fluffy, just like the kind you’d receive at a diner. Serve them with a little butter or preserves, or make yourself a breakfast sandwich with eggs and cheese. The whole recipe takes no longer than twenty minutes from start to finish. That’s as much time as it’d take you to pop open and bake the Pillsbury biscuits. Did I mention you only need four ingredients for these? Which is the convenient option now? Love biscuits but don't want the calories? 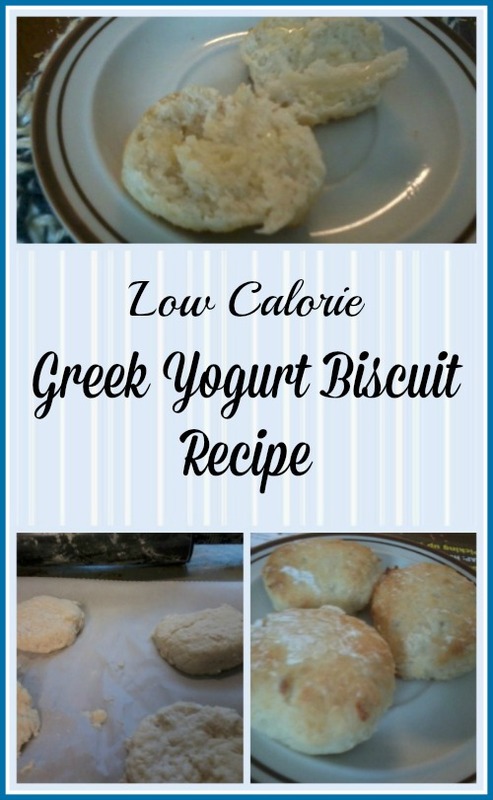 These low calorie, low fat biscuits are a great for people who are on a diet or trying to make guilt free versions of one of their favorite foods. Preheat your oven to 425 degrees Fahrenheit. Use parchment paper to line a baking sheet. Whisk flour and sugar together in a large bowl. Add yogurt and half of the milk, stirring until the dough starts to come together. Add a little bit of the rest of the milk at a time (you may not need the entire ⅛ c that's left) until the dough forms. Knead the biscuit dough JUST until smooth (it will be a little sticky). You don't want to overwork the dough. 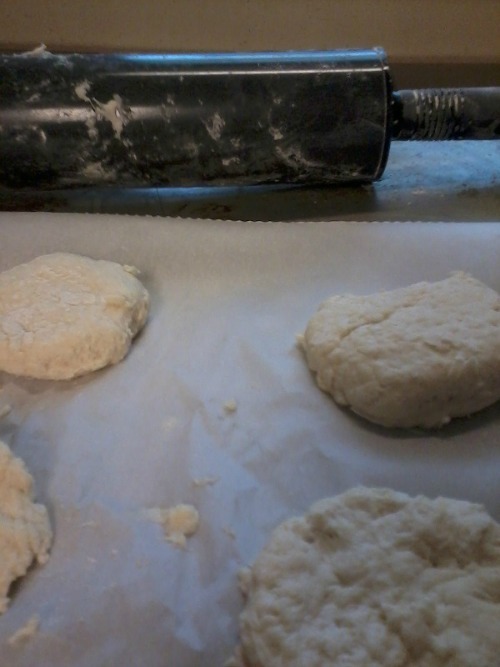 Use a floured rolling pin to roll out the dough 1'' thick. If you don't have a rolling pin, you can just use a floured drinking glass instead. Once it's rolled out, cut into rounds. Since I don't have a biscuit cutter, I just used a ⅓ cup measuring cup for this part. You could also use a drinking glass if that's what you used to roll out your dough. Place the Greek yogurt biscuits on your baking sheet one inch apart from each other. Bake 10-15 minutes, until golden brown. I only had to bake mine 12 minutes, so keep an eye on yours while they're in the oven. I got about 9 biscuits that were just over 2.5 inches in diameter out of this recipe, but depending on how big you cut yours you might end up with a slightly different amount. I am so excited! We love biscuits especially for breakfast. With eggs and cheese and/or meat my kids can feel full and no sugary cereal. These could not be any easier to make with only four ingredients. My kids will be in heaven. Thank you for the recipe! You are very welcome! Demi always makes amazing, healthy recipes! I can’t wait to make these. They look so good. Thank you for sharing the recipe. This sounds like a super good recipe. I will definitely try it. Thanks for sharing. Wow these sound and look great. Thank you for sharing your recipe. 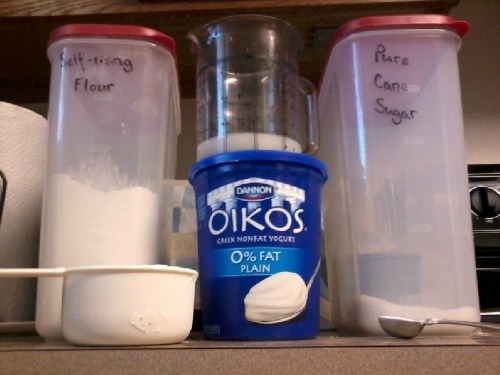 I’ve not tried biscuits made with greek yogurt, let alone that I haven’t made them myself. These look good and look like a great alternative. We’ve been using greek yogurt for our smoothies and we like the change. I hope your mornings have slown down a bit. These biscuits look like they turned out great. I love trying to make something a bit healthier and I always have a bit of greek yogurt on hand. Thank you for the recipe! I love biscuits with honey, but hated how bad they were for you. I will have to try this recipe. Thanks for sharing! Can you use regular yogurt instead? I’m not fond of Greek yogurt. Sorry Lisa, I haven’t tried it with non-Greek yogurt so I can’t vouch for the results. I will say that you can’t taste the Greek yogurt in these, but if you decide to make the recipe with regular yogurt then please let us know how it goes! Omg I totally have all these ingredients right now! I might make some later, this looks super simple and easy! This looks like it will be tasty! I want to try. I can’t wait to make these and try them out ! The recipe looks very yummy. I love most recipes that have yogurt in them. I will have to try this recipe, maybe tonight. Magically delicious! Our entire family loved these! I’m so happy to hear you all loved these! Great, I’ll have to wait until winter because I can’t run the AC and oven at the same time – cost too much. TFS. I am on a quest to find the perfect biscuit recipe. This one looks promising! In summer time when it is so very hot we use the devil out of our little counter top toaster oven. 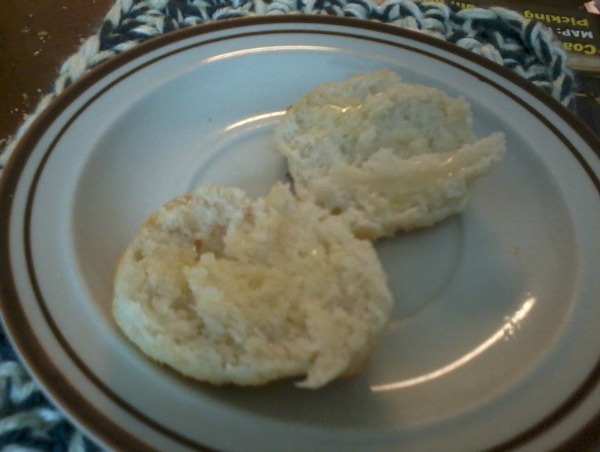 Being southerners we love to have a biscuit on the side of every supper. For so long now I have played with the ingredients trying to hit on a biscuit that rises but not too high. Has a dense texture but still a little flaky and always a bit moist but not soggy. Picky aren’t I? So far I have not hit just right. I will most certainly give this a whirl and see how it goes as I have not tried Greek yogurt yet. Perhaps this is the mystery ingredient that I have been lacking to make my perfect biscuit! Thank you for sharing this recipe,they look so good. I can’t wait to make these bet the will taste great ! I make biscuits at least 3 times a week, but I never tried a recipe like this one!!! My only problem is I like Greek yogurt so much, I might eat it all before I can make the biscuits with it! But I can hardly wait to try this!! They look so tender and delish! I am So Happy to make these biscuits..thank you for sharing the recipe .. Using yogurt to make biscuits, that’s interesting. I would definitely try this, thank you for sharing this great recipe, I can’t wait to give it a try. I think I’m going to make these. My husband just said that they look good so, I’ll try it 1st with Greek yogurt. then maybe I’ll try regular. I’ll let you know. I’ll have to keep this one in mind! Of course, I’ll have to make it gluten free but it shouldn’t be that bad!